I was so excited when I was asked to join the Expressions Vinyl Ambassadors in a fun Christmas challenge. We were all given the same package of heat transfer vinyl and asked to create a stocking. The parcel included traditional holiday colors in red, green, white flocking, glitter HTV in both silver and gold, and holographic red. Since I love traditional decor during the holidays I thought I’d whip up a faux wool sock stocking! You may recognize the stocking a tiny bit. 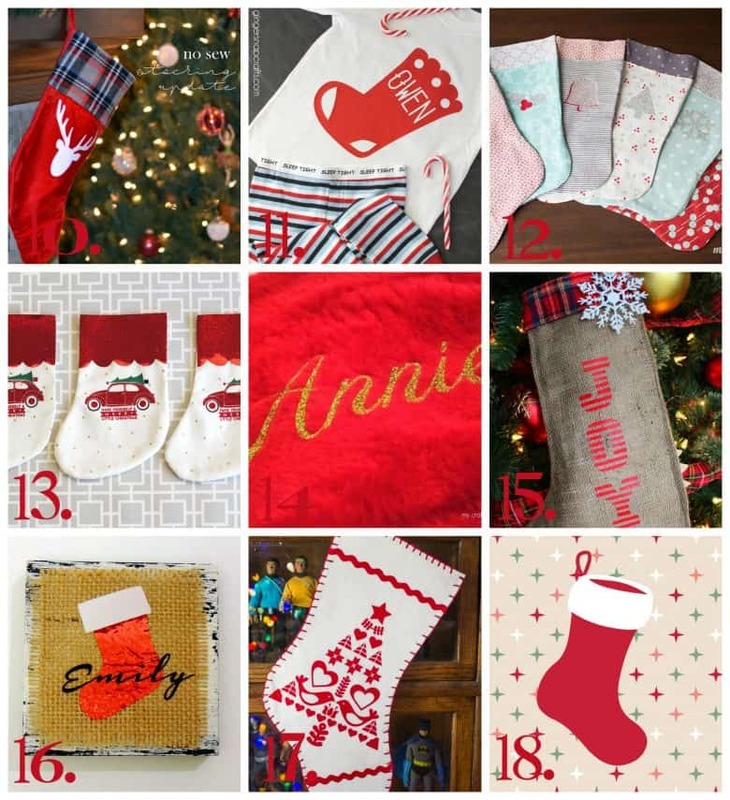 I used the same pattern to create our family stockings last year, see them here. The stockings are fairly easy to sew by following the pattern provided. 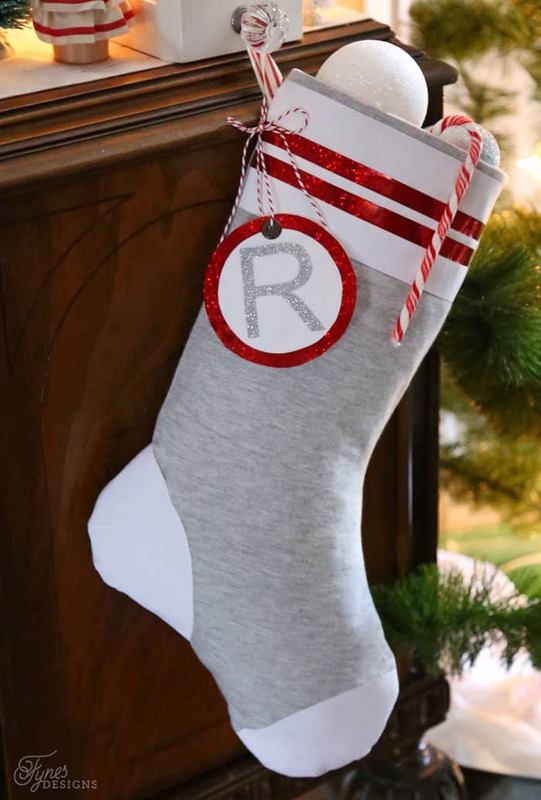 However using heat transfer vinyl, you’ll shave off about 30 minutes per stocking. Plus, you won’t need an electronic cutter, I cut all the HTV pieces by hand! I first cut out the grey fabric pieces and applied iron on interfacing to give the fabric a bit of stiffness. 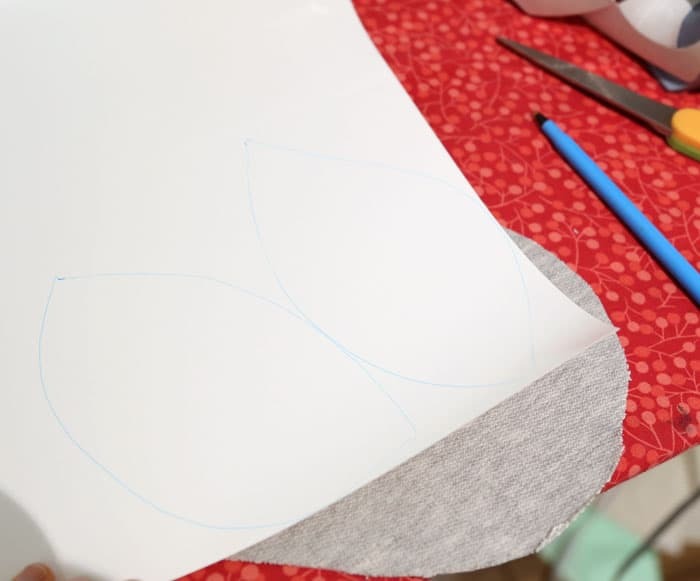 Then traced the heel, toe, and band onto the backside of the white flocked heat transfer vinyl. Then simply cut out the pieces, positioned them on the grey stocking fabric, and pressed with the iron to adhere. Find details how to use HTV on the Expressions Vinyl blog. Doesn’t the wool sock stocking look sharp hanging from the DIY Stocking Hangers I made last year?! 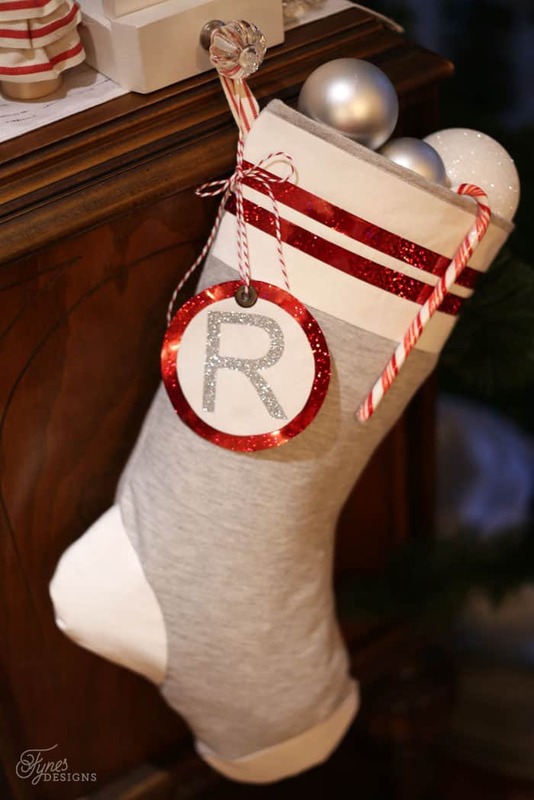 To personalize the stockings I added a fabric tag with a monogram with glitter HTV, and trimmed it with red holographic vinyl. I love how the sparkle catches the light, Santa will certainly be able to find it! 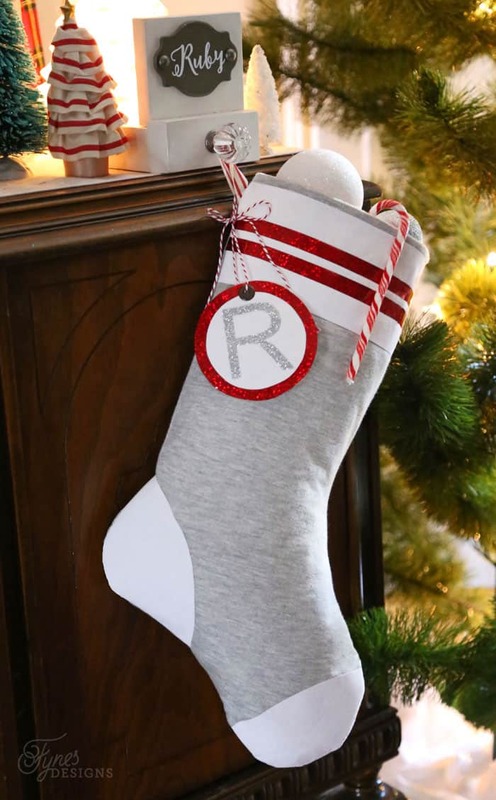 These wool sock stockings were so easy to make with heat transfer vinyl! Great stocking! Love the color choices. These look great! I just love the stocking hangers too! 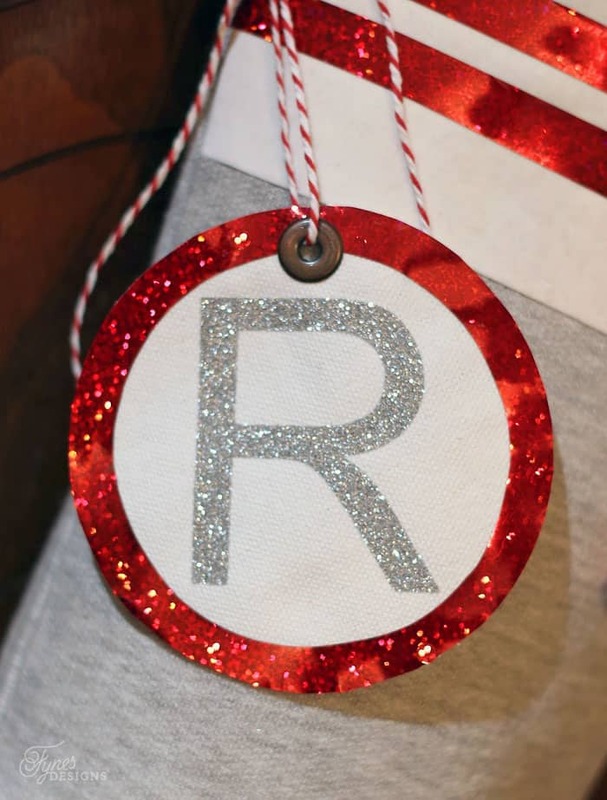 That glitter will for sure catch Santa’s eye! So pretty and shiny. I love them, and the stocking holders too! This turned out so cute! I especially love the toe and heel details! Ooo, you’re totally making me want to give that holographic red a try! 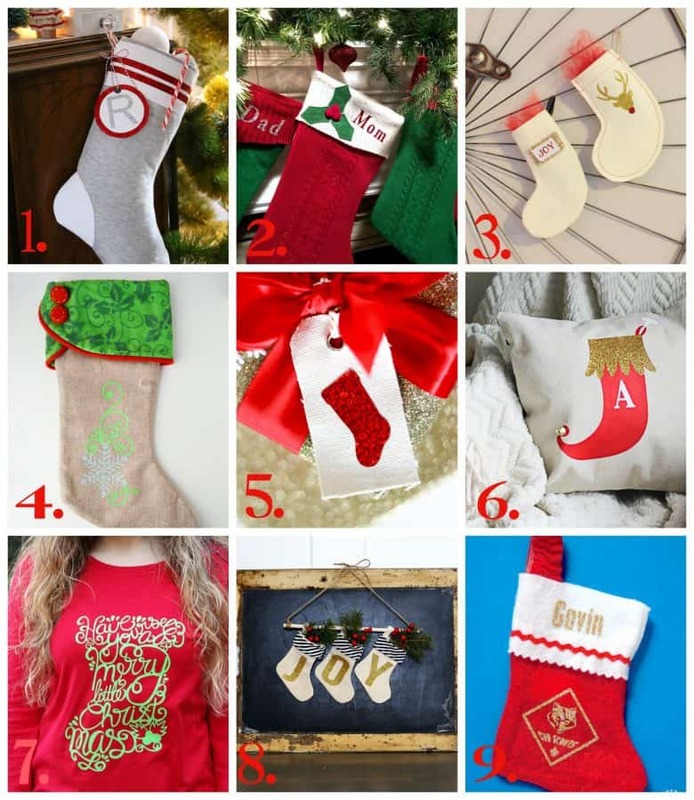 LOVE the stocking hangers too!